This is what scary looks like. 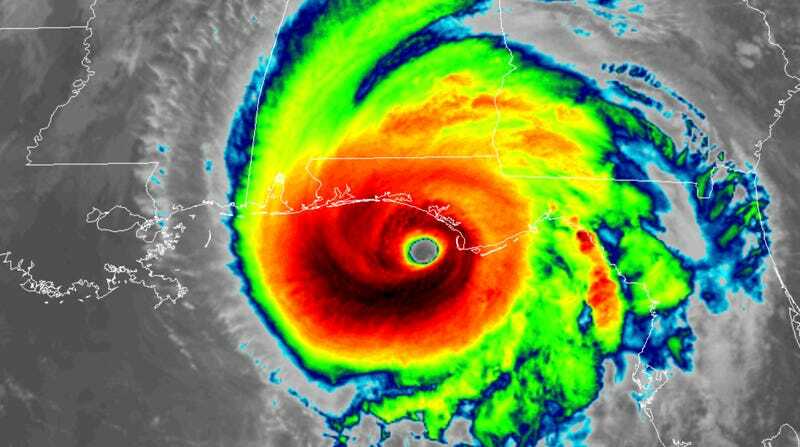 The Florida Department of Corrections (DOC) has evacuated six of its facilities, amounting to about 850 prisoners, in wake of historic Hurricane Michael. However, 13 counties across Florida have mandatory evacuations in place. That leaves 15 other facilities in those counties that are still potentially in harm’s way. Needless to say, prison advocates are pissed. Fight Toxic Prisons, a group that organizes around healthy environments for incarcerated people, issued a call Wednesday pushing the public to convince the DOC to move more prisoners out of the storm’s path. Apparently, its cries went unheard. The department defended its decision not to evacuate more facilities in an email to Earther, noting that mandatory evacuations don’t always encompass the entire county. For example, in Bay and Dixie counties, evacuation mandates are for specific zones or mobile homes. Still, there are facilities clearly in the path of the now-Category 3 storm that haven’t been evacuated—like the Bay Correctional Facility in Panama City and the Apalachee Correctional Institution West and East units near the southwest Georgia border. It’s difficult to say exactly how many incarcerated people are currently locked up in facilities within the storm’s path. Some of these prisons can hold up to 1,500 people while others max out at just over 800, but it’s unclear how many people are actually in the prisons at this time. Earther has asked the DOC for additional information on the state’s prison population. From our own analysis, it appears facilities in the storm’s path can potentially hold up to about 7,000 incarcerated people. No matter the number, these people are locked up in cages, likely to lose power. The department isn’t providing further updates on facility conditions yet, but prior storms have shown us how uniquely vulnerable incarcerated people can be during these events. During Hurricane Katrina back in 2005, the Orleans Parish Prison was left abandoned with waters rising up to prisoners’ chests, according to the American Civil Liberties Union. Just last year, Hurricane Harvey left women at the Carole Young Complex in Dickinson, Texas, dealing with terrifying floods. And Florida’s response to Hurricane Irma last year wasn’t that great, either. Instead of evacuating the populace, the department brought more guards into its Southwest Miami-Dade Prison and forced them to stay put, according to an investigation by Miami New Times. Some of those guards allegedly had to stay in cells filled with urine, feces, and mold. Imagine what it was like for prisoners. The full impacts of Michael won’t reveal themselves until the storm has passed, the waters recede, and authorities can access the facilities themselves. Maybe these prisoners are all right. Maybe the waters didn’t reach them. Maybe the winds didn’t tear the prison apart. The way prison advocates see it, however, the state could’ve done more to make those “maybes” certain. And if the state can’t protect these people, Tsolkas would like to see it abnegate its responsibility for them regardless of the “public perception of releasing prisoners,” he said. While this may sound radical, the idea of abolishing prisons has been picking up steam, especially given the discriminatory rate at which blacks and Latinx are incarcerated. Update 5:31 p.m. ET: This post has been updated to note 850 incarcerated people have been evacuated, data the Department of Corrections provided via email to Earther.